A charming and informative reference book that helps young children learn about the food we eat, where it comes from and how to maintain a healthy diet and lifestyle. Answers questions such as “What is pasta?”, “Where does milk come from?” and “How do vegetables grow?” – nutrition is a key UK curriculum topic. 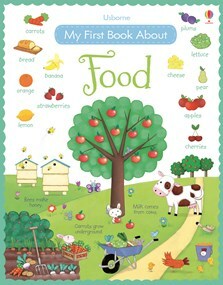 Also explores concepts such as going shopping, life on a farm and cooking and eating healthy meals. An essential reference book that’s perfect for schools, libraries and home, with an index and contents list and internet links to age-appropriate websites with games and activities.